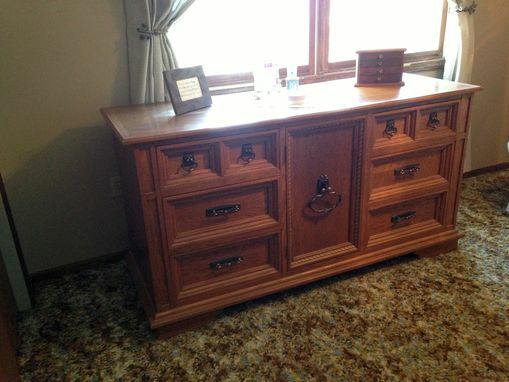 This Oak Bedroom Dresser was made from oak and oak plywood. The drawer parts were made from reclaimed hardwoods collected over a period of time from discarded furniture, mostly poplar and pine. 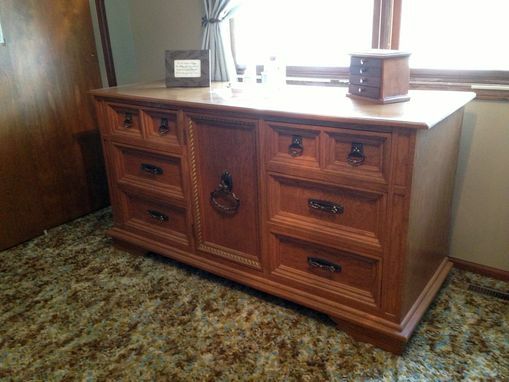 The doors and drawer front have a gold colored rope twist moding that hightlights the design. The Oak Bedroom Dresser was stained a golden oak, "distressed" by sprinkling an ebony stain all over, and then coated with a satin polyurethane. Antique brass hardware completes the design.